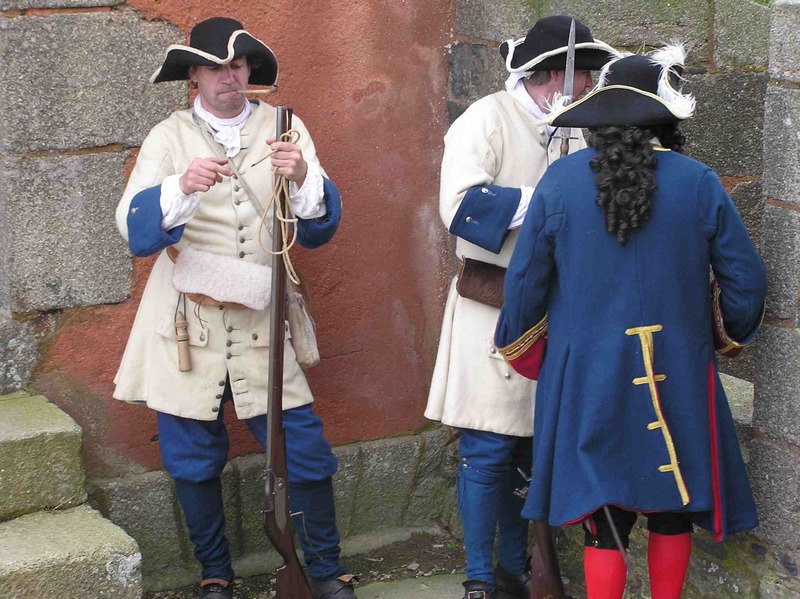 Huchehault in the late 17th C. and early 18th C.
In 2007 (300th anniversary of Vauban's death), Huchehault was asked to organize public displays at Camaret (west Brittany), and in Mont-Louis (in the french Pyrénées, near the spanish border). on guard at Camaret tower (near Brest) in july 2007. 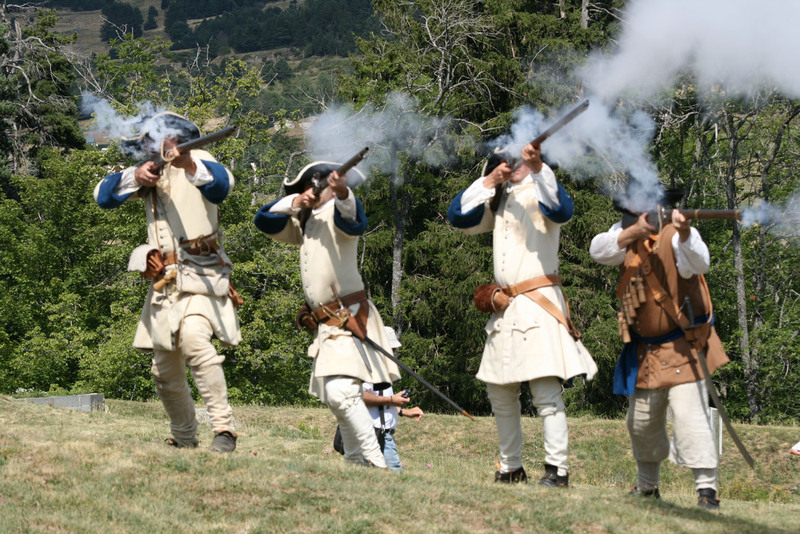 Huchehault (the man on the left) and other french troops firing near the citadel of Mont-Louis, august 18th-19th 2007. 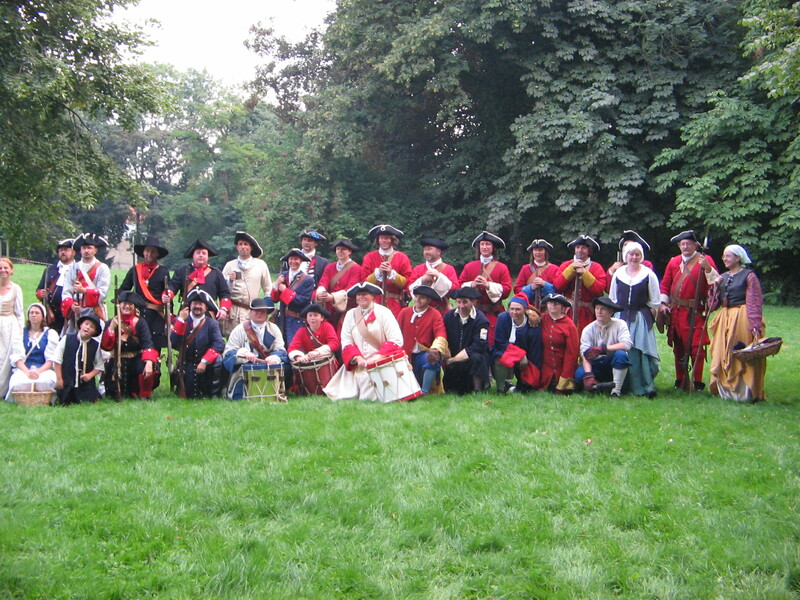 For the event at Mont-Louis, Huchehault gathered forty fellow re-enactors from France, Spain, Great-Britain, and Ireland. A display of some of France's best enemies (c.1700 British artillery !) 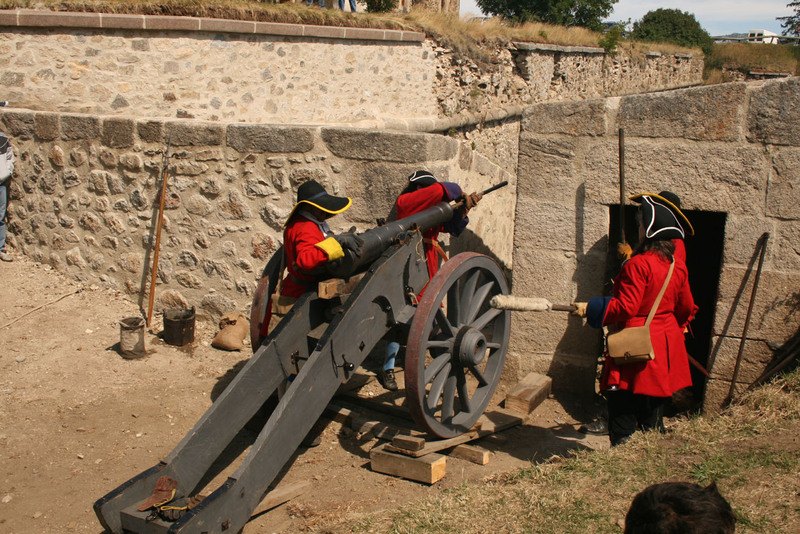 on a bastion at Mont-Louis in august 2007. The reign of Louis XIV "the Sun-King" may be thought of as a period of glory and pleasures. And certainly this was true for some people. But many other aspects, closer to the everyday life of most of the people, more realistic, and sometimes sader, should not be forgotten. There are many ways for a good-humoured soldier to bring these memories back ! Huchehault took parts in many campaigns and battles for the king, and he saw and heard many a thing. So he tells and explains these events and facts to all the people he meets. Re-enactors from six different countries (French, British, Dutch, Italian, German, and a drummer from Norway) assembled with Huchehault at Waterloo (Belgium) to commemorate the « first battle of Waterloo, 1705 » in 2005. Historical display at Fort la Latte castle (north Brittany), august 2004. Huchehault may appear alone, or accompanied by other characters : peaceful civilians, or other soldiers, or some sailors from a ship's crew. 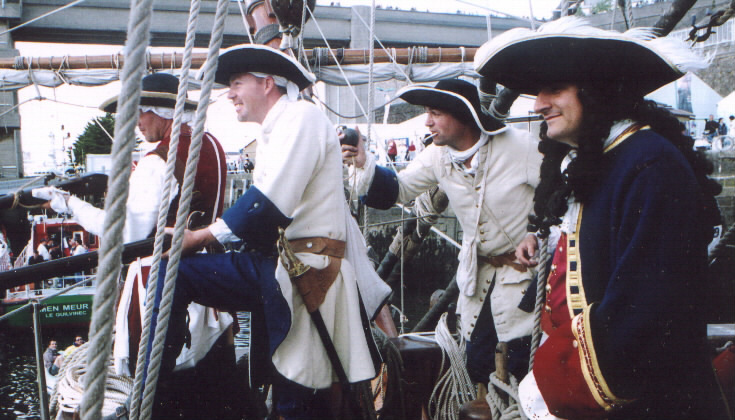 And sometimes he encounters sailors who do not seem very honest, and this may cause many other adventures... for this was also the period when pirates roamed the seas ! 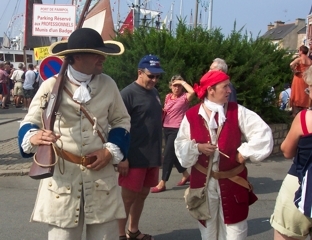 Huchehault, and actress Annie Souillé, walk the quays of Paimpol (north Brittany) during the « Festival du Chant de marins » in 2003. Is the kingdom well guarded ? Huchehault is also very efficient in patrolling the streets to maintain the king's law and order. Especially when he encounters would-be enemies of the realm ! This is a good way to entertain and educate passers-by about the context and political events of Louis XIV's reign, even in their darkest and most tyrannical aspects. As France was at war with half of Europe most of the time (or at war with most of Europe half of the time), any foreigner may be suspected to be a spy. British tourists won't be released until they promise to get rid of William III and to have James II back on the throne of England ! And to a loyal soldier of the Sun-King, most french people are no more reliable either : for example, do these innocent-looking children go to mass every sunday ? Huchehault asks them, and if they answer "non", he tells them what their future will be : "The galleys, in Marseille, with all the Huguenots !" "No, he isn't an operetta soldier !" the sea is wet !